I have just been playing away this weekend and not doing anything else. I am getting bored again and this is not good. I don't like not having anything to do other than scrapbook. 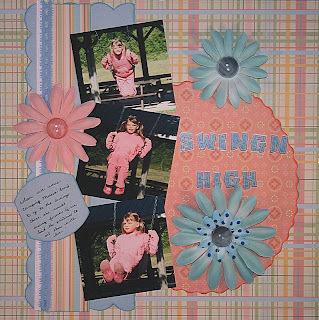 Tis true that I love scrapbooking but when it is all that you have to do it quickly becomes boring. I shouldn't complain, at least I do have something to help me pass the time which some people don't have. Also come summer I will be complaining that I don't have enough time to scrap... just can't keep me happy I guess LOL. After that one I did the March 1st sketch challenge for Creative Scrappers this one only took me a few minutes to do as it is a pretty simple design. 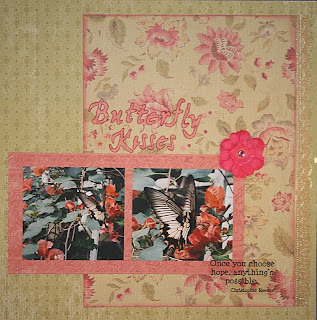 I used all K & Company papers on this one and I love the quality to this pad.. I can honestly say this is one pad that will get completely used up. Stuck a transparent quote on the botton, a little dollar store flower with a bling brad and a Martha Steward gold border, cut the title with the stone age cricut cart and was done... easy peasy as my friend Mel would say. I was fooling around with a couple of sketches that I found somewhere online(am always browsing somewhere or another and then promply forget where I was)and came up with these two layouts as well. 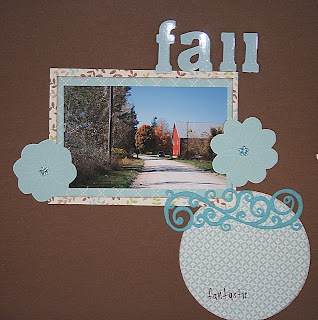 For this one I used all Martha Steward papers, even the flowers are cut from MS paper. The chipboard alphas are from the Dollar store, as is the bling and the rub-on. I am not sure where the felt came from. 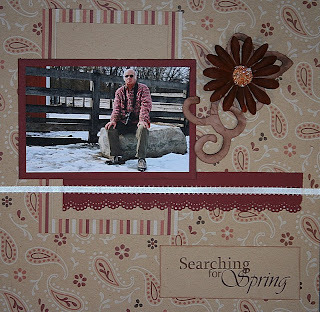 For this one I used Kaisercraft papers, FancyPants chipboard, Petaloo flower and did the title in Photo Shop using the Vivaldi font. You are getting a ton done. I am so jealous. Hopefully I can get my scrapping stuff unpacked some time this week, although warmer weather is forecast too. Have a great week! Wow Jackie, your getting so much done. Now we are having March Break here at my home, I am hoping to get some of these challenges done as well. I don't know if you do cards or not but if you need a change why not check out Cards365 blog, they have some great things to challenge us all now. Love your layouts, especially that last one of your hubby. I love anything brown and chipboard is my favorite thing. Cheers. Loving the layouts..and the wonderful photos you used! You always capture such great nature shots!! !